The American Haiku Archives advisory board is pleased to announce the appointment of John Stevenson as the 2018–2019 honorary curator of the American Haiku Archives at the California State Library in Sacramento. This honor recognizes the excellence and range of Stevenson’s haiku and haibun, his longtime service to the haiku community, especially as an editor, publisher, and adjudicator, and his other teaching and leadership roles. Stevenson was born in Ithaca, New York, and now lives near Albany. 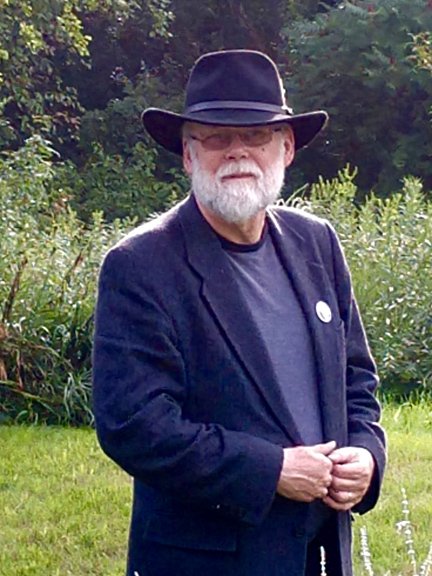 He is a former president of the Haiku Society of America, former editor of Frogpond, and currently serves as managing editor of The Heron’s Nest. He is a founding member of the Route 9 Haiku Group, which has published the semiannual anthology Upstate Dim Sum since 2001. His haiku-related publications include Something Unerasable (self-published, 1996), Some of the Silence (Red Moon Press, 1999), Quiet Enough (Red Moon Press, 2004), Live Again (Red Moon Press, 2009), and d(ark) (Red Moon Press, 2014). His poems and books have won numerous awards in most of the leading haiku contests. In 2015, he also codirected the Haiku North America conference at Union College in Schenectady, New York. We are pleased to celebrate John Stevenson, and to bestow this honor from the American Haiku Archives, which seeks to preserve and promote haiku and related poetry throughout the North American continent. The AHA advisory board is delighted to pay tribute to John Stevenson as the twenty-second honorary curator of the American Haiku Archives. To search the collections of the American Haiku Archives online, please visit http://www.library.ca.gov/. For information on donating material to the archives, or other information about its history and past honorary curators, please visit the American Haiku Archives website at www.americanhaikuarchives.org. Excerpted from “American Haiku’s Future” published in Modern Haiku 34:3, Autumn 2003. In New York State, in the land of the old Iroquois Confederacy, is a writer with a darker vision than most American haiku poets. John Stevenson, who was born in Ithaca on October 9, 1948, grew up in the wooded farm and vineyard areas of the Finger Lakes region, and has lived all his life in New York. Half his life has been spent in rural areas, the rest in Buffalo, Ithaca, and New York City. He now lives with his teenage son in Nassau, a small town near Albany, and works as an administrator for the New York State Office of Mental Health. Stevenson was a poet long before coming to haiku in 1992, writing and publishing his first poem at the age of eight. Since 1993, when he joined the Haiku Society of America, his poetic muse has been devoted to haiku and he has been busy in the haiku community, editing books, judging contests, and working as coordinator for the Northeast Metro Region of the HSA in 1995–96, traveling to the city to attend the group’s meetings, and serving as HSA president in 2000. In 1997 he edited From a Kind Neighbor, that year’s HSA members’ anthology. Stevenson began as an art major at Buffalo State College but graduated with a degree in theater and was a professional actor for most of his twenties. He has been involved with a kind of improvisation called playback theatre for about ten years. Stevenson relates this activity to his haiku writing, believing that the two pursuits “have important areas of shared aesthetics.” To one who knows Stevenson’s haiku, especially his recent book, Some of the Silence (Red Moon Press, 1999), it is not surprising that he admires the work of Samuel Beckett: “Beckett’s impulse toward ever briefer dramas both parallels and strongly contrasts with my sense of the motives that attract me and other Westerners to the brevity of haiku.” Stevenson’s views of life and the world, and his choice of subject matter, result in haiku that suggest the cynical and ironic existential despair that Beckett’s plays relentlessly and broodily embody. Of course Stevenson writes other kinds of haiku as well, but this trend is apparent in much of his work. At least in the second of these two haiku there is a mysterious sense of unseen forces at work and that even if they may not save us they are at least something—something more than absolute nothingness. a change in their voices . . .
of a jigsaw puzzle . . .
in dishwater . . .
Something Unerasable. Nassau, New York: self-published, 1996. Some of the Silence. Winchester, Virginia: Red Moon Press, 1999. (winner of the first place Merit Book Award from the Haiku Society of America). (winner of the first place Merit Book Award from the Haiku Society of America and the Touchstone Award). (winner of an honorable mention in the Merit Book Awards from the Haiku Society of America). Stevenson, John, Editor. Ferris Gilli, Paul MacNeil, Fay Aoyagi, Billie Wilson, and Scott Mason, Associate Editors. Nest Feathers: Selected Haiku from the First 15 Years of the Heron’s Nest. Heron’s Nest, 2015. (winner of the Touchstone Award). Emoji Moon. Winchester, Virginia: Red Moon Press, 2018. Stevenson, John. “Haiku as Dimensional Object.” Frogpond 36.3, (2013): 61-63. Stevenson, John. “Two and Two.” Frogpond 34.2, (2011): 93-95. Archive for John Stevenson, Mann Library’s Daily Haiku, October 2012. Aguilar, Dorina. “John Stevenson’s Touch of Familiarity Versus Chiyo-ni’s Touch of Feminity.” Global Haiku Traditions, Millikin University, (2002): n. pag. Web. 5 March 2016. Aguilar, Dorina. “Real Symbolism: Reading John Stevenson’s Haiku.” Global Haiku Traditions, Millikin University, (2002): n. pag. Web. 5 March 2016. Bilyeu, Nicole. “John Stevenson’s Haiku.” Global Haiku Traditions, Millikin University, (2001): n. pag. Web. 6 March 2016. Buzan, Ciara. “John Stevenson’s Haiku.” Global Haiku Traditions, Millikin University, (2004): n. pag. Web. 6 March 2016. Edwards, Monica. “John Stevenson’s Haiku.” Global Haiku Traditions, Millikin University, (2010): n. pag. Web. 5 March 2016. Freimuth, Patti. “John Stevenson’s Haiku.” Global Haiku Traditions, Millikin University, (2005): n. pag. Web. 6 March 2016. Hixson, Catherine. “The Honest Haiku of John Stevenson.” Global Haiku Traditions, Millikin University (2012): n. pag. Web. 5 March 2016. Orr, Stacey. “John Stevenson’s Everyday Haiku.” Global Haiku Traditions, Millikin University, (2003): n. pag. Web. 6 March 2016. Villarreal, Jessica. “John Stevenson’s Haiku.” Global Haiku Traditions, Millikin University, (2008): n. pag. Web. 5 March 2016.